Black Tie Brass is a horn-driven jazz/funk band from NYC. We combine the presence of a New Orleans brass band with the sound of a funk band to create a musically invigorating experience. Having played together for many years, the core of the group came together in 2013. Drawing from many genres such as jazz, pop, funk, R&B, and hip-hop, they created a fulfilling musical experience for performer and listener. Black Tie Brass is a versatile group that has performed with Sal "The Voice" Valentinetti, Epic Records' Nick Tangorra, American Idol's Robbie Rosen, and many more! 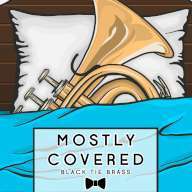 Ryan McNulty of Black Tie Brass granted permission to add a collection on archive.org for live audio recordings for public download and noncommercial, royalty-free circulation. Black Tie Brass is open to all manner of recording & board patches are allowed. As long as none of it interferes with the enjoyment of their fans, etc. Venue or festival policy may override band's recording policy in certain cases. Just make sure to post your recordings up on archive for all to enjoy, y'all! !